(P1) NASA announced on Thursday that it has found the first near-Earth-size planet orbiting in the HABITABLE zone of a star that is similar to our own sun. (P2) Scientists don’t yet know FOR SURE if the planet spotted by the Kepler space telescope, dubbed Kepler-452b, can support life. It’s in a region where temperatures are right for liquid water and is only about 60 percent larger than Earth, giving it a decent chance of being rocky like our own planet. NASA scientists also expect that Kepler-452b would have a slightly thicker atmosphere than Earth and probably still have active volcanoes, making it a pretty lively place even if it doesn’t have life. (P3) A year on the new planet is just 20 days longer than a year here and its sun is about the same size and temperature as our own. It’s about 1.5 billion years older than our sun at 6 billion years, but it has nearly the same temperature and mass. (P4) The age of this distant solar system is also important because it provides plenty of time for life to develop in a form similar to something like what we’re familiar with. In fact, Kepler-452b has had more than a billion-year HEAD START on the Earth. (P6) There is one difference between Earth and Kepler-452b that distant future visitors would surely notice, however. The newly known planet has gravity nearly twice what we’re used to, but Jenkins suspects that HYPOTHETICAL human colonists would be able to WITHSTAND and adjust to being heavier. (P8) The Kepler telescope has discovered other near Earth-size planets in the habitable zone of their stars. 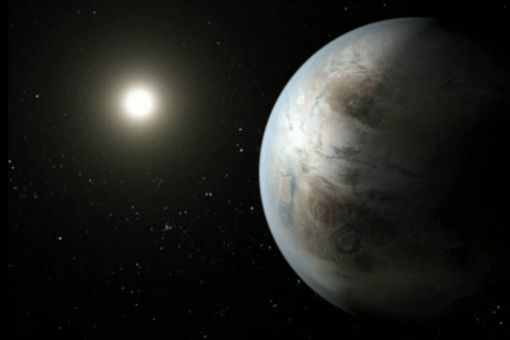 In fact, Thursday’s announcement of Kepler-452b was also accompanied by news of 12 other new planet candidates near Earth size, and in orbit in their stars’ habitable zones. Of those, nine orbit stars that are similar to our sun. These are just planet candidates that have yet to be confirmed like Kepler-452, which is the first confirmed planet spotted that hits the TRIUMVIRATE of being the right size in the right place, and is also around a star that is the right size (at least from an Earth-CENTRIC perspective). (P9) In recent years, the Kepler mission has helped PAINT A MORE COMPLETE PICTURE of the universe, which it now seems clear is full of planets. (P10) The discovery of a planet potentially capable of supporting life is, of course, not the same as finding a planet actually HARBORING life. The next generation of ground-based and space telescopes will eventually be able to identify a “breathing” planet. When you were in school, were you more interested in science and mathematics, or in the humanities? Would you volunteer to travel to another planet? Do you think that there will be human colonies on the moon or other planets in our lifetime? Do you enjoy science fiction movies, or do you avoid them?